So on to hooking… Hooking is basically the opposite to prodding. Instead of ‘prodding’ a small piece of fabric from the back throught o the front of the hessian, you ‘hook’ a long strip of fabric from the backthrough to the front with a crochet hook. Rag rugging is really very simple. The tutor said the best type of fabric to use for hooking is jersey t shirt material. Before we started we cut up an old t shirt along the bias (diagonally) into about 1 cm strips. I then began to hook my sample. Iknew we would only be doing a small area so I decided to ‘hook’ in the shape of a tulip to make it a bit more interesting. I even added a little stalk and leaves in green. When I had finished my tulip looked like this. I had no idea what to do with it once it was finished and squirreled it away until I got home. Once home I was wracking my brains as to what I could do with it, I didnt want to just throw it away after all my hard work! Nick is on a mission at the moment to throw out all my clutter. If he found my fabric scrap it would be a goner! I wondered if I should frame my little masterpiece and hang it on the wall? I don’t think Nick would approve of it hanging in our new living room.I then had the great idea to make something for the nursery. The nursery walls look quite bare at the moment as they are, you guessed it, all white! 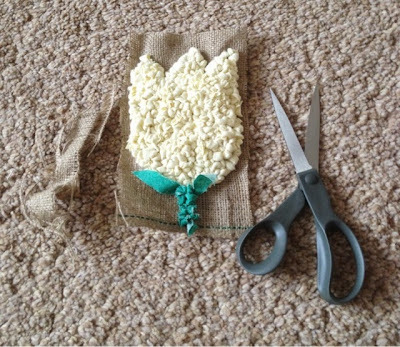 My baby is going to love my tulip because her mummy made it for her and so I set about turning the little sample into something that I could hang on the wall. I decided a canvas would look better than a frame. Thecanvas I bought from the 99p shop for yes, 99p. I then covered it in the pinkgingham fabric that I had left over from the old duvets we had to cut up on thecourse. 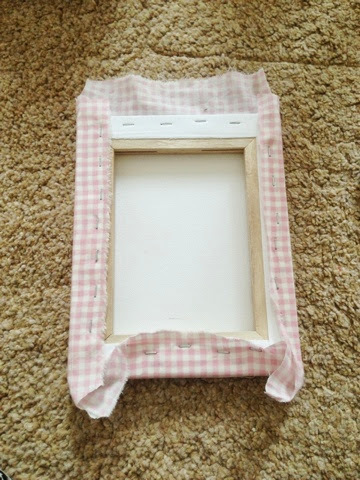 There is a lot of pink gingham in the nursery so I hoped this would tieit in with the theme. I cut, well tore actually, a rectangle of fabric an inchbigger than my canvas on all sides. 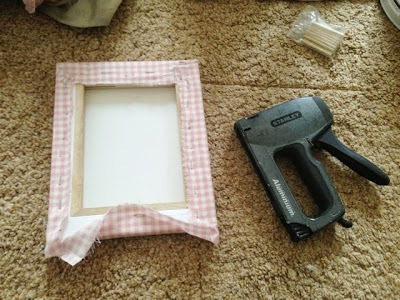 I then pulled the fabric taught and stapledthe fabric onto the frame on all four sides. I left the corners to the end andthen folded these in as neatly as I could. 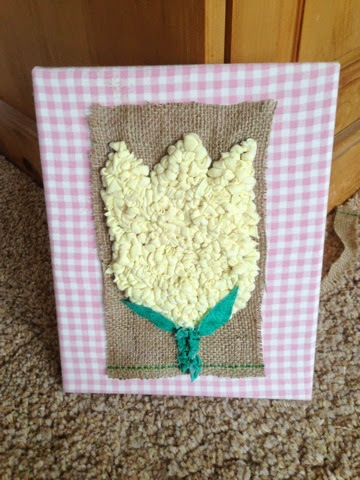 I then tidied up the edges of the hessian on the tulip andjust stuck it on the front in the middle of the canvas with a pritt stick. Job done! a piece of ‘Art’ (ahem!) for the nursery made out of an old duvet and an old t shirt and cost me 99p!